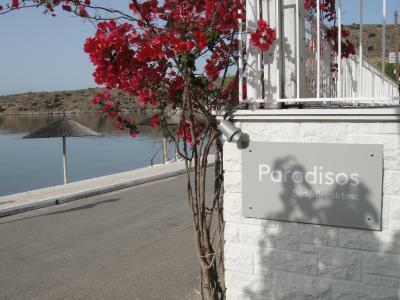 Lock in a great price for Paradisos – rated 9.1 by recent guests! We liked absolutely everything. 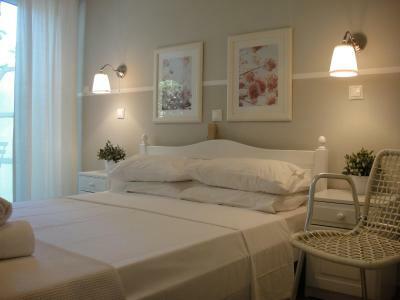 Charming rooms, good breakfast, sparkling cleanliness, close to all historic places. And the most amazing intelligent friendly host. That was our fourth trip to Greece. The best place. 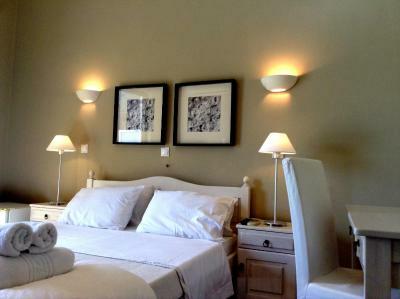 We thoroughly enjoyed our stay at Paradisos Boutique hotel. We stayed in one of the front rooms that has a view of the sea from the balcony. 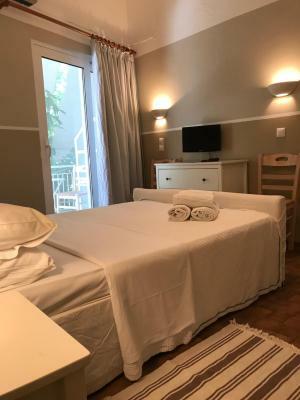 Yes the rooms may be a bit small but the hotel has a large communal area where you can sit and relax and it also has a very large balcony with sun beds overlooking the sea. Our hosts were so helpful and went out of their way to make our stay very enjoyable. 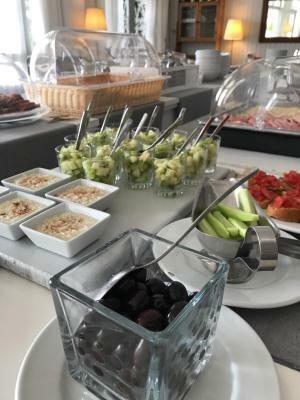 The breakfast was extensive including freshly made smoothie, rice pudding, plentiful homemade jams, the best honey ever and beautiful Greek yogurt, plus anything else you could want for a hearty start to the day. They don’t do lunch or dinner but there are a couple of tavernas in town and nearby towns. 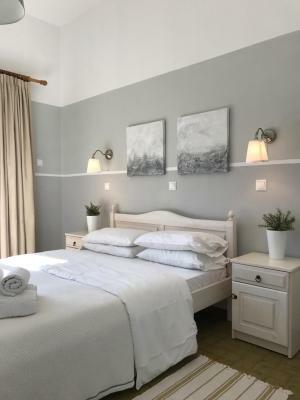 This hotel is situated in a quiet small village (mainly frequented by locals) which is really perfect if you’re searching for a relaxing place away from all touristic crowded resorts. 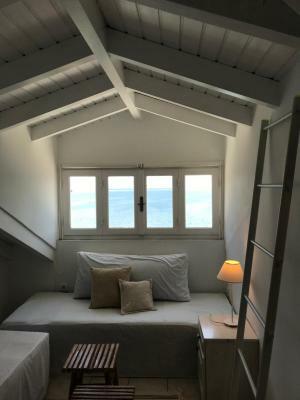 It’s really nice renovated and it’s located exactly in front of the sea. 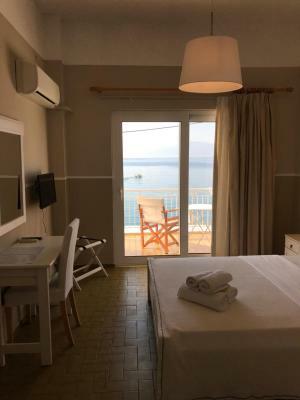 We stayed in a lovely and clean double room with balcony and sea view. 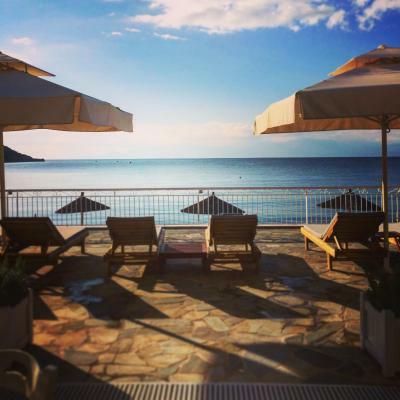 We had access to the sun beds on the sea as well to the sun beds on the hotel terrace. The breakfast was tasty with a lot of homemade and local products. The staff was really friendly and helpful providing us a lot of information regarding where to go or to eat. There were some local taverns nearby, one where we ate fresh fish and lamb chops. Everything was excellent. The hoste was very helpful and very nice. The breakfast was wonderful, everything you want, they have. 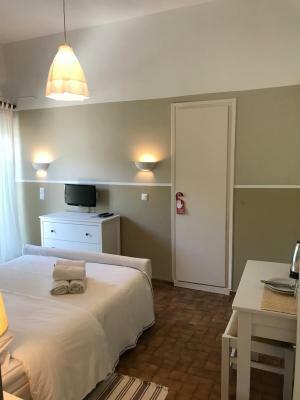 The room was very good and very nice and cleaning. The hotel is near the beach and we have a wonderful view in every morning and evening. Thanks for everything. It was more than wonderful. Much kiss for staff. Thanks you. Nice breakfast with local snacks! Quite location just by the sea! We were welcomed by the friendly owner. He gave us good advice of the restaurants in the area. 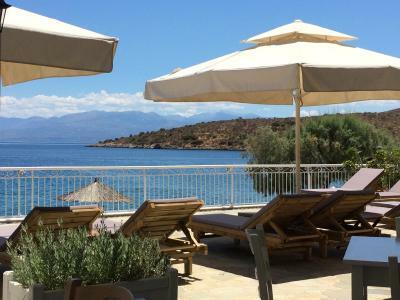 Fantastic beachfront location of the hotel in a small Greek village. 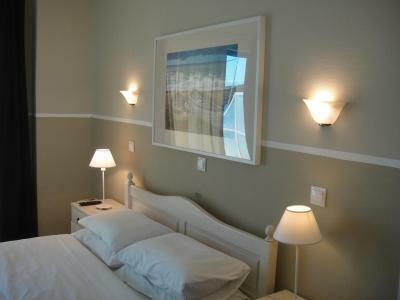 The seafront rooms with balcony was very clean. Just sorry we could not swim as it was raining. 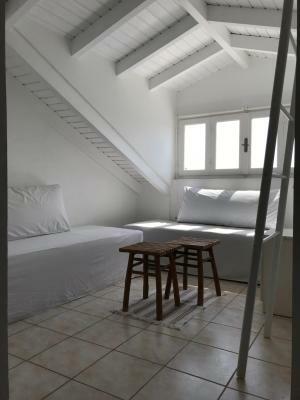 Beautiful, simple decor - stylish and airy. 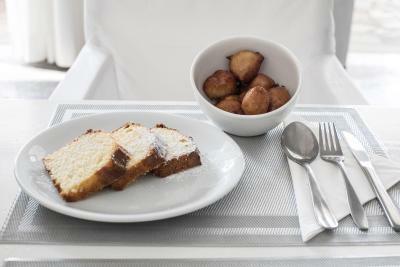 Perfect, big breakfast with homemade cakes and jams. Good wi-fi. I would recommend you to stay at this hotel. We had an excellent dinner at a small taverna just down the road. Breakfast is amazing, big choice and a lot of home made products. Lady owner who is taking care of breakfasts is very sweet and welcoming. 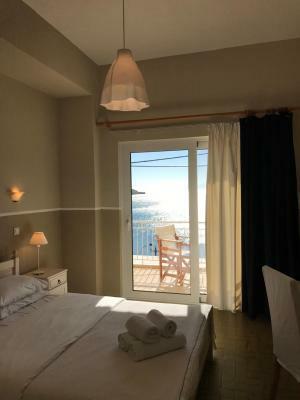 Rooms with sea view are beautiful. 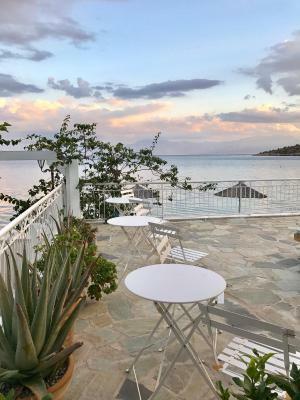 Located right by the beach, Paradisos Hotel features a lounge area with fireplace, and a breakfast area. 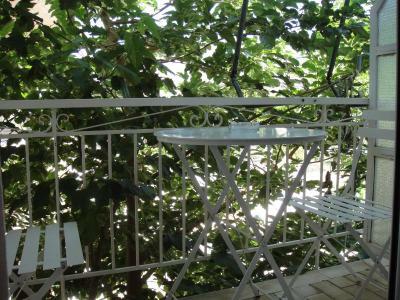 It offers air-conditioned rooms with private balconies in Agii Pantes. 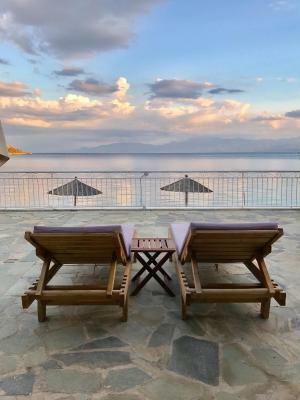 Paradisos Hotel rooms have private balcony, some of which offer sea or mountain views. 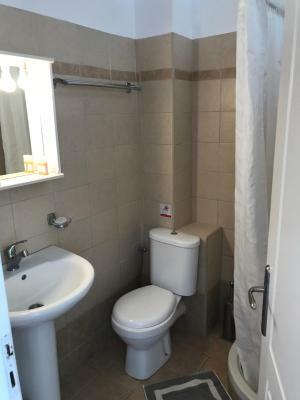 Each is carefully furnished and includes a seating area with sofa. 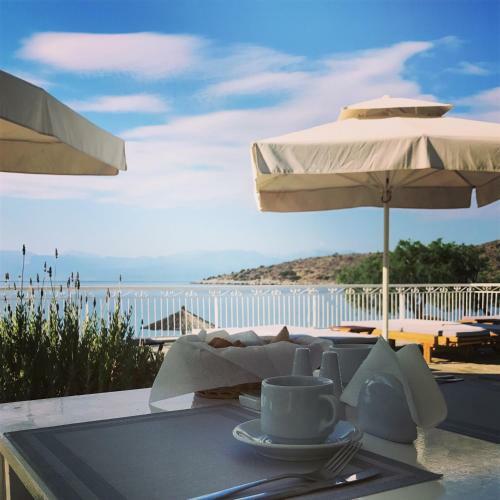 Guests can start their day with a traditional home-cooked breakfast served daily at the relaxing setting of the breakfast area or at the outdoor dining area overlooking the sea. 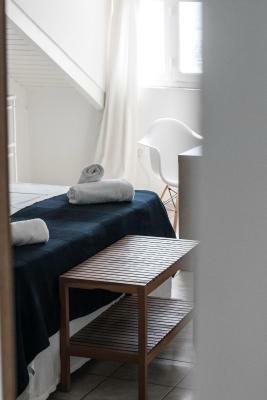 Hotel Paradisos guests will also find some free sun loungers. After a long day of sunbathing, guests can relax at the hotel’s lounge. Winter guests will also enjoy the fireplace. 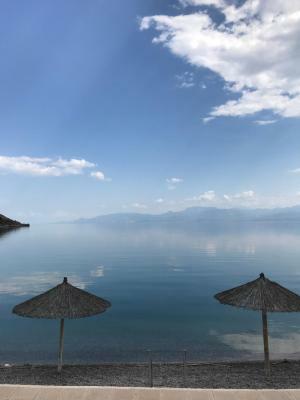 The Hotel Paradisos is 5 mi from the scenic Galaxidi. The front desk provided guests with tourist information. Free parking is provided. 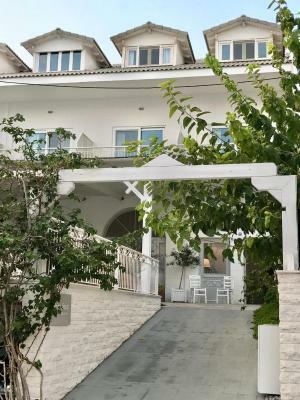 This property also has one of the top-rated locations in Áyioi Pándes! Guests are happier about it compared to other properties in the area. 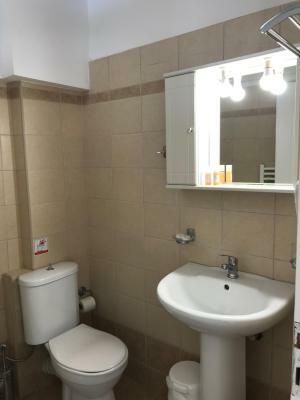 This property is also rated for the best value in Áyioi Pándes! Guests are getting more for their money when compared to other properties in this city. 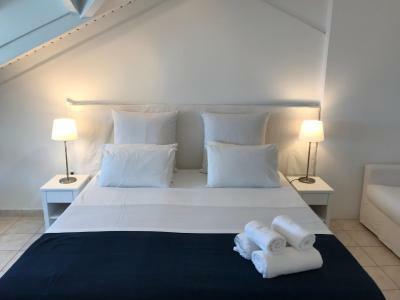 When would you like to stay at Paradisos? This room has a private balcony with garden view. This room has a balcony with sea view. 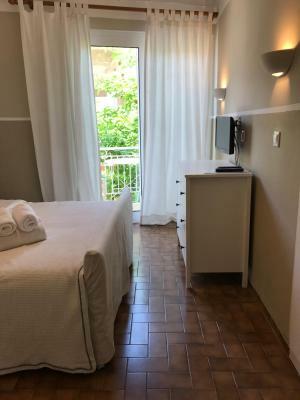 This double room has a tile/marble floor, sofa and flat-screen TV. 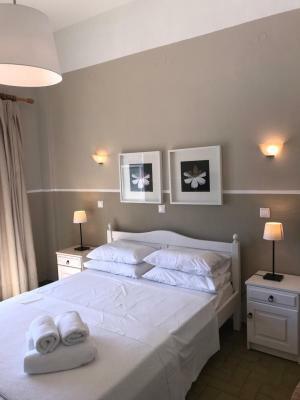 This triple room features a sofa, air conditioning and seating area. 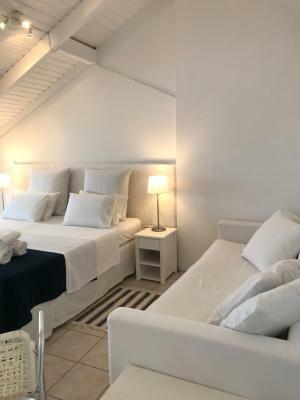 The guest house is located by the beach .It's an early 80's building which was recently renovated in modern and country style. The purpose of th renovation was to make an harmonic relationship of the hotel with the surrounding area. House Rules Paradisos takes special requests – add in the next step! Paradisos accepts these cards and reserves the right to temporarily hold an amount prior to arrival. Please note that late check-out is available at extra charge. For late check-out between 12:00 and 18:00 half the room price will be charged, while after 18:00 the total amount of the room price will be charge. Please inform Paradisos of your expected arrival time in advance. You can use the Special Requests box when booking, or contact the property directly using the contact details in your confirmation. There was some noise at night from traffic on the main road going around the village and also barking dogs outside. Too bad, because they distracted from the nice sound of the sea. 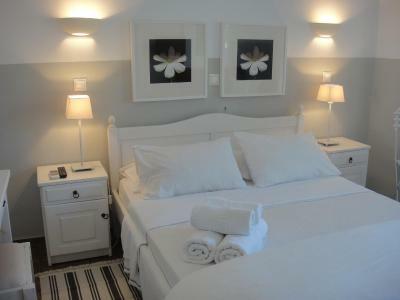 Nicely decorated hotel right by a beautiful Blue flag beach, book a room with stunning sea view. Nice breakfast and friendly staff! A bar to serve cocktails or other drinks within the hotel would be a great value for it. 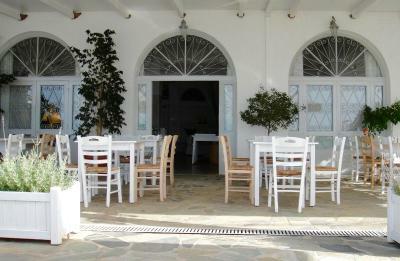 We would have loved to stay on the terrace or the beautiful lounge to serve some drinks or even something to eat. There were only two small local stores in the village next to the hotel, but they were poor supplied. Good food, incredible view, good accommodation, helpful staff. Everything is just amazing about this place! Nothing serious. 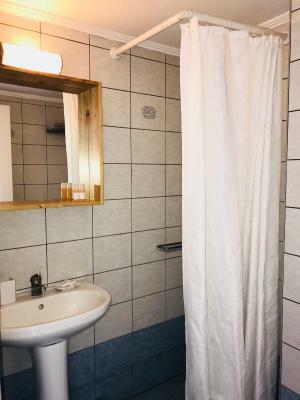 Room could be a bit larger, shower was not that practical because of the use of a shower curtain. 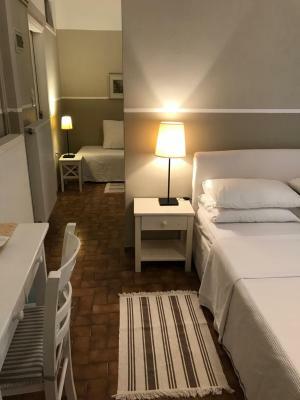 Great small hotel directly at the beach in a small village. Friendly and helpful staff with good English language skills. Great breakfast, sitting at the terrace with sea view. 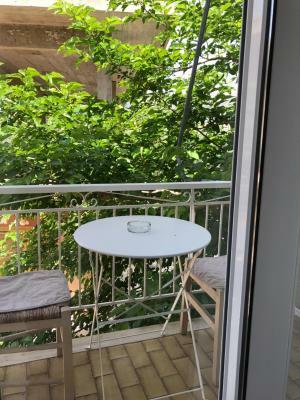 Good and efficient room with nice balcony. Several small restaurants nearby, 15 minutes by car to a bigger city with many shops and restaurants. Great beach with clear water and plenty of small fishes. Very warm reception. Very nice breakfasts! Location. If you seek for total loneliness, probably you'll love it. It's very small town, literally few houses there, two taverns and small supermarket, short beach line to walk. The shower curtain was not very effective. 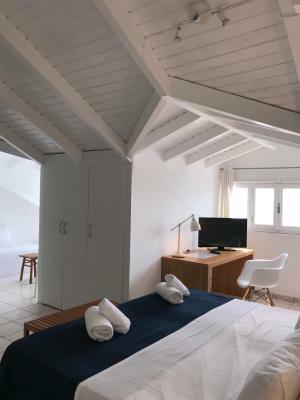 Charming hotel few steps from the beach and the sea. Perfect breakfast with home made jam and the most delicious cappuccino freddo. 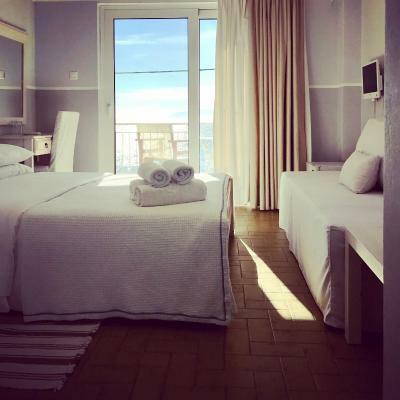 If possible, choose rooms with the sea view, it’s worth it. This is a real find! Fantastic location, wonderful owner, great breakfast, I couldn't recommend it more! 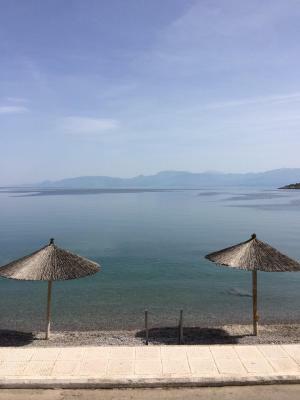 To go for a swim and then have a great breakfast with view of the sea and mountains.... who doesn't want that? 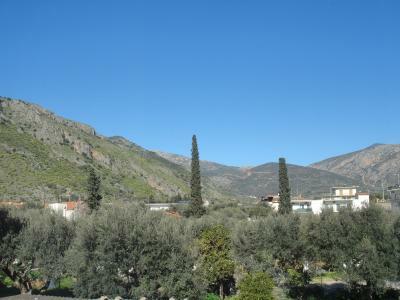 we went here after visiting Delphi, it was a great choice.